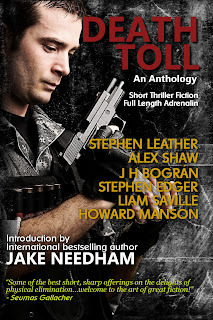 DEATH TOLL: An Anthology Short Thriller Fiction; Full Length Adrenalin-- Stephen Leather, Alex Shaw, JH Bográn, Stephen Edger, Liam Saville, and Howard Manson, with an introduction by Jake Needham. You are embarking on an expedition into the dangerous, deadly world of assassins, spies, cold-blooded killers, rogue robbers and ruthless revenge. Of course the stories are great. They wouldn't be here otherwise. But the inspiration was to create an opportunity for some brand new writers to work alongside a few seasoned writers and a few bestsellers and then see their work published with the best in the business. The result is a collection of eight short stories that delight in the ultimate dirty deed. Everybody dies, but some deaths are just more entertaining than others. We’ve found those for you, and this anthology is here to introduce you to the work of these excellent thriller writers: established, and up and coming masters of the short story form. 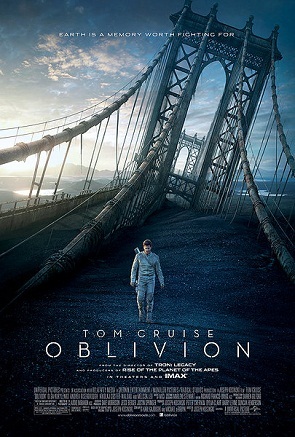 By some weird quirk of life, Tom Cruise’s new movie Oblivion opened up in my neck of the woods a couple days sooner than in the U.S.
Not the first time, won’t be the last time either. Last night, my wife and I went to see it with the hopes that the title didn’t refer to the actor’s career. The first thing that caught my attention, before even the movie started, was the trailer for the After Earth. I mean, come on, this means movies with settings in post-apocalyptic Earth is the new “black” in the Hollywood fashion world. But let’s go back to Oblivion. After a disturbing introduction narrated by the Jack Harper (Tom Cruise), we are shown a world destroyed, abandoned, and most of it poisoned with radiation. However, Harper and his Supervisor are stationed to maintain and safeguard some equipment necessary for the Earth survivor’s colony in the moon Titan (Yes, the same one used by the Enterprise to hide from the Narada in the 2009’s reboot of Star Trek). Trouble soon arrives Jack discovers who the real enemies are. Action packed, filled with non-obtrusive visual effects. Even if the story is not entirely original, the thrills are enough to sit through your urge to buy a popcorn refill. All in all, the movie is not half bad, actually. And for a 50 year old, Tom can still pull it off as a mid-thirties guy. The Assassin's Mistress will be free 4/13 through 4/15. That's 3 days!